Banner from Taylor & Francis online. Polish Independence Day is celebrated every year on November 11. In the United States, we celebrate November 11 as Veterans Day. The United Kingdom celebrates November 11 as Armistice Day. The single event all commemorations trace back to is the end of World War I on the eleventh hour, of the eleventh day, of the eleventh month. Germany signed an armistice agreement with the Allies that morning. Poland returned to the map of Europe for the first time in 123 years. Perhaps you’re wondering, where did Poland go? Geographically, Poland is positioned between her two historical enemies to the east and west, Russia and Germany. The countries of Prussia (modern day Germany) to the west, the Austrian Empire to the south and Russia to the east became threatened by Poland’s independent spirit when it enacted the first European constitution in 1791 modeled after the young United States. These three powers conspired together and each took part of Poland for their own. Poland disappeared from the map of Europe until November 11, 1918. It then re-emerged as a free and independent country, which today is often referred to as the Second Polish Republic. Germany invaded Poland on September 1, 1939, sparking World War II. When Russia invaded Poland from the east on September 17, 1939, the country was once again divided and invaded by her enemies, then occupied by foreign forces for nearly six years. Poland truly suffered more than any other European occupied country. Even worse, due to several devastating diplomatic moves, after the war, Poland fell under communist rule until 1989. Communists forbid any recognition of an ‘independent’ Poland, or any teaching of Polish history or heroes. 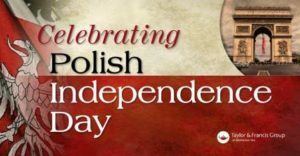 The celebration of Polish Independence Day did not resume for fifty years. In honor of Veterans Day, I post a picture of my paternal grandfather. who fought in World War I. 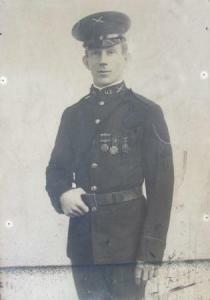 We know only that he was officially a cook, but the French government awarded him the Croix de Guerre medal for valor. We were never able to find out what he did to earn the prestigious award. On a fun note, I found this short video of a Polish history segment on Jeopardy! I can’t resist because the woman with the answers and who ends with the highest points is named Katrina. If you’ve read this far you’ll get the Daily Double. I also located this website that has more interesting articles relevant to Poland. I am not recommending or validating the info, but it’s worth checking out. Taylor & Francis. This entry was posted in Polish History by Katrina Shawver. Bookmark the permalink. Thank you Lucyna. Your words honor me. Katrina you are a gifted writer about subjects I love. History and Poland! Thanks Wayne! I’m honored to have you as a reader.